Located next to the Gemaldegalerie of painting masterpieces, the Museum of Decorative Arts(Kunstgewerbemuseum) in the Kulturforum complex holds a very underrated and impressive collection of top-notch exhibits in fashion, design and object art from the Middle Ages through the Art Deco period. I was particularly impressed with the monumental Renaissance tapestries. To be sure, the medieval and Renaissance art was astounding, especially the Guelph Treasure from the 12th century. Objects from the Baroque era also stood out, including furnishings and a cabinet of curiosities from that era. Rococo porcelain, such as Meissen, is well-represented, too. The Art Nouveau and Art Deco collection spans from 1900 to 1920. I was drawn to the Art Deco vases and the furniture in both styles. On the lower level, there is an intriguing exhibition of chairs from the 19th century to the present. It was fascinating to see how chair design had developed through the ages. One chair was made of what looked like wire; I could not imagine how painful it would be to sit on it. Another resembled an ice cream cone in a playful yellow with white color combination. Normally, I am not interested in fashion at all, but this collection caught my undivided attention. I loved the stunning evening dresses plus the older fashions from 1700 to 1850. I could never wear a corset! This museum outdid my expectations, and I came away with a fonder appreciation of fashion, design and art in general. I was able to go by car to the villa where Slovak architect Dušan Jurkovič lived from 1907 to 1919. 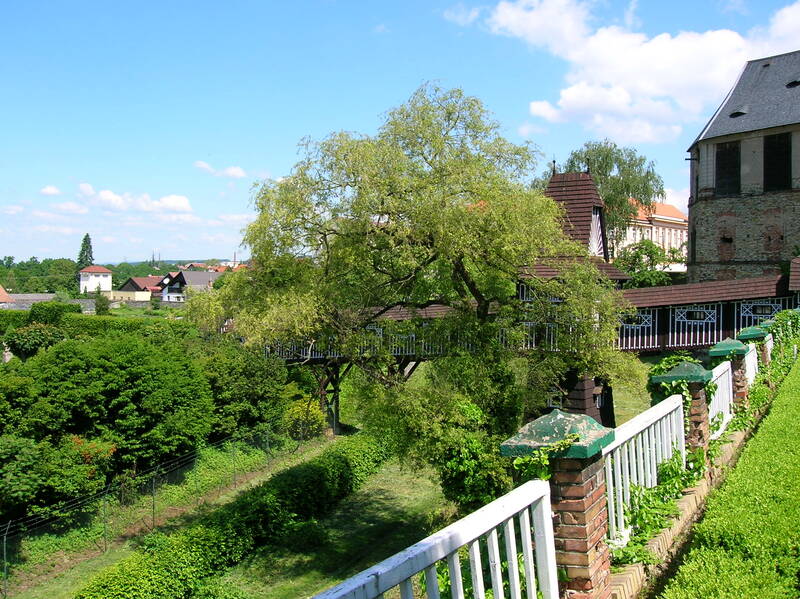 It was in a tranquil village near Brno, the capital of Moravia. The architectural gem had opened in 2011. I did not know much about Jurkovič except that he was responsible for much of the stunning décor in the Coffer Room of the Nové Město nad Metují Chateau as well as the renovation of that chateau’s two-tiered garden. While visiting the villa, it would become clear to me that Jurkovič was one of the leading architects in the Czech lands during the 19th century and that this house was his most prominent work. This leading Slovak architect had been inspired by Austrian architects Josef Maria Olbrich and Josef Hoffmann, both of whom, along with artist Gustav Klimt and others, co-founded the Viennese Secession or Art Nouveau movement at the end of the 19th century. Jurkovič had especially been influenced by Olbrich’s Secession style Darmstadt Artists’ Colony, where Art Nouveau artists lived and worked. One of the Secession features on the houses included the decoration at the entrance with its gold-plated floral motifs. 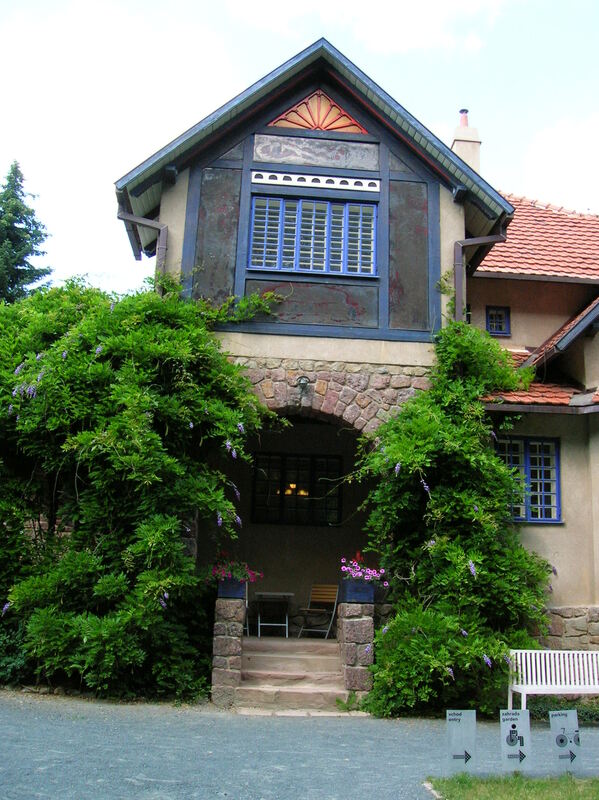 Olbrich’s style mixed British tendencies with central European qualities. 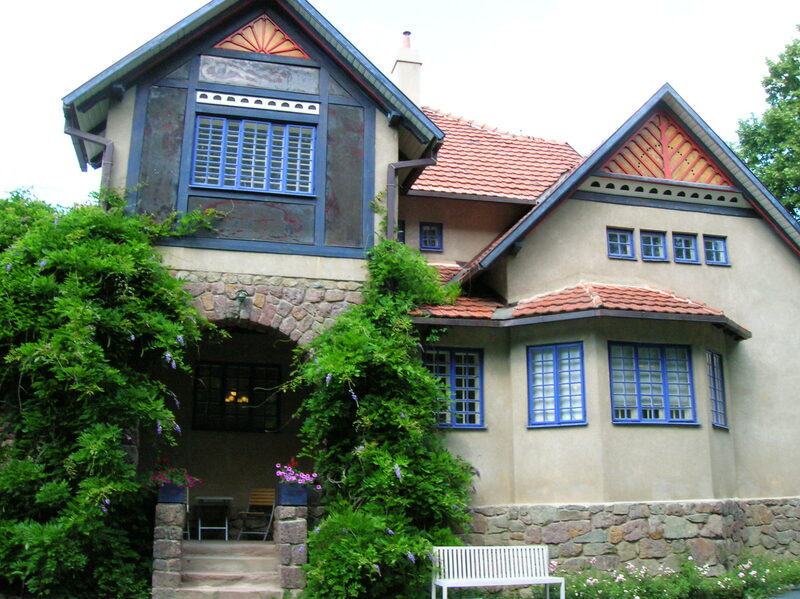 Hoffmann’s Hohe Warte Artists’ Colony, launched in Art Nouveau style, was another influence. Jurkovič had originally intended that his villa would become part of an artists’ colony, and he even opened the villa with an exhibition of 119 artworks, many his own, in 1906. First, I walked through the garden, bursting with color and featuring pergolas and trelliswork. The view of the house from the garden confirmed that Jurkovič had created his own unique style by meshing several styles together. The house was a mixture of English Arts and Crafts, Art Nouveau and traditional Moravian folk architecture. During the 19th century, the Habsburgs of the Austro-Hungarian Empire supported European folk art because it united its regions. Folk art would play a major role in architecture during that century. As I understood it, the English Arts and Crafts movement had emphasized simplicity and had employed romantic and folk styles. The materials used were also accented. Also British architects often featured a staircase hall, which dominated Jurkovič’s main achievement. The movement reached its peak from 1860 to 1910. Jurkovič’s villa looked like it belonged in a fairy tale. I expected princes and maidens to stick their heads out its windows. I loved the playfulness of its design as if it had popped out of a story book. It was no wonder that it had been dubbed “the Fairy Tale House.” The villa was made of stone, wood and cork with lime-coating on the exterior and plaster on the interior. 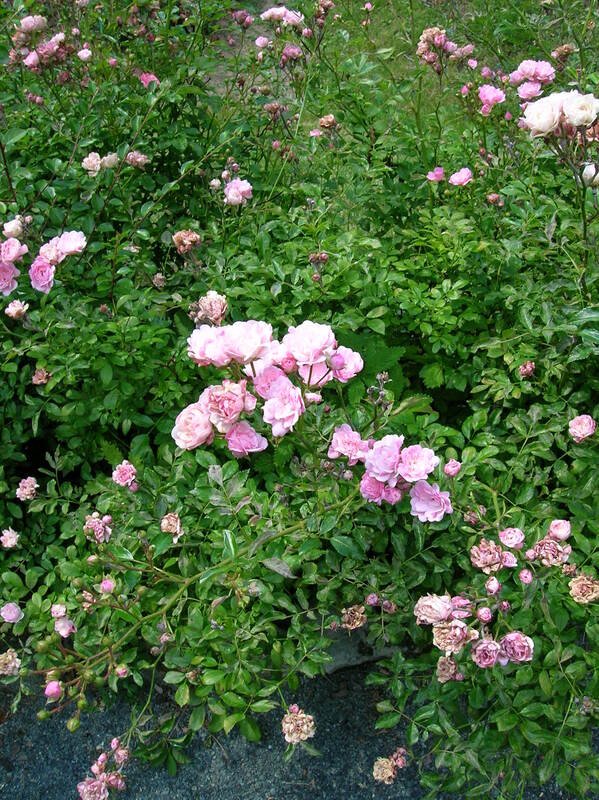 It resembled a country house or cottage in England. At the entrance gate there was a mosaic of two peacocks standing opposite each other. There used to be a mosaic showing a scene from The Shephard and the Dragon fairy tale, but it was destroyed because it had been made on a cork rather than plastered base. The mosaic that replaced it lit up at night. The entrance loggia featured the statue, “The Thinker,” by sculptor Jan Štursa, who had helped define modern Czech sculpture. 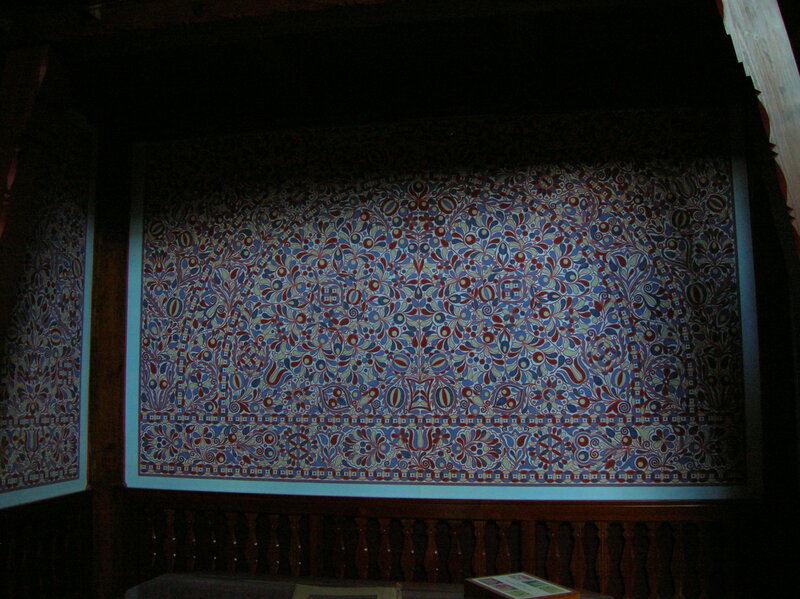 It was one of the few original pieces that were now in the villa. The house had been renovated to look as it had when Jurkovič and his family had lived there from 1907 to 1919, when the architect returned to Bratislava, Slovakia, where he died in 1947. Soon it was time for my tour, which had to be booked in advance. My tour guide and I entered the main room of the villa, the Staircase Hall. It was dazzling. I especially loved the folk elements of traditional Moravian architecture, such as the red, white and blue abstract wallpaper on one side. The folk-oriented carpet featured reds and blues, too. The wine red and forest green colors represented in the room also symbolized Moravian folk art. I thought they complemented each other well and gave the place a cozy atmosphere. I recalled that in the Coffer Room at Nové Město nad Metují, reds, greens and browns played major roles. Ceramics and tapestries also filled the room. The tiled stove was dark green, and the doors took on the same hue. The wallpaper was not the only part of the room to have blues in it. Even the exquisite, wooden table had a stunning, blue tone. The chandelier, though, was pure Art Nouveau and had featured light bulbs, as the villa had utilized electric lighting. The alcove, designed for Jurkovič’s wife Božena, was light and airy in contrast to the dark central section of the room. I admired the tapestries in the alcove. One showed a log cabin with mountains in the background. The others shared the countryside theme, depicting fields and cross stations. The room was assembled like a gallery of Jurkovič’s work. He had also designed the furniture. I realized that the villa itself was an exhibit with smaller exhibits inside. Jurkovič’s former study rooms featured a temporary show of furniture designed during the middle of the 20th century. Artists Zdeněk Plesník and Miroslav Navrátil used materials experimentally. Their armchairs were made from bent lamellas, which were fine sheets of material positioned in the shape of gills. The armchairs could be put into several positions. They could function as chairs or as a bed, if all three were placed together. I was surprised to find out that Navrátil had created the chairs on trams. Even now, trams 1, 3 and 11 in Brno were equipped with the style of chairs that he had created. I often took tram 1 to the center, so I had actually sat on a chair that he had designed! Other spaces that used to serve as a bedroom, children’s bedroom and bathroom were now decorated with pictures of Jurkovič’s other designs, interactive materials and furniture from his other buildings. I found out that he had also designed the interior of the Vesna boarding house in the Czech lands. The bedroom there boasted vibrant hues of greens, yellows and reds. Jurkovič also incorporated a dovetail motif. I saw a stunning wooden chair with a dovetail masterfully carved on its back. 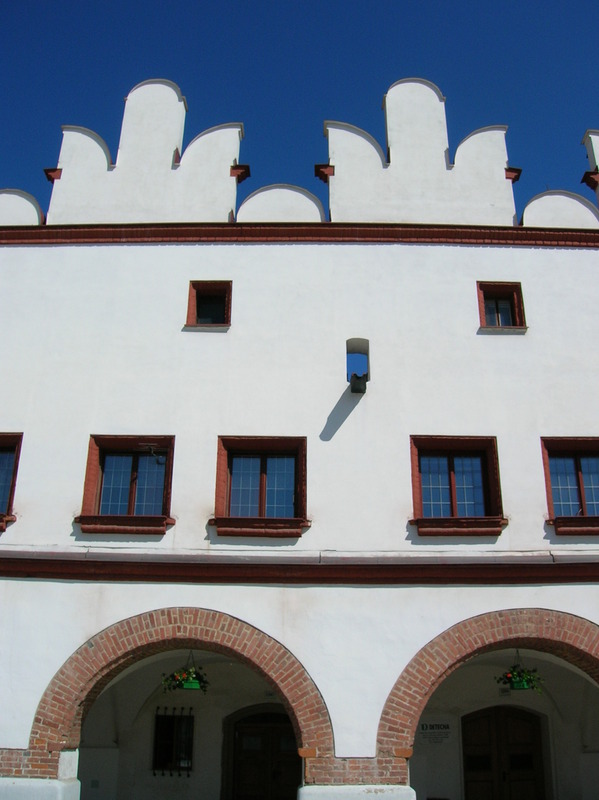 Jurkovič would also design a diner and hostel in Wallachian Pustevny in triumphant folk architectural style. The diner boasted an interior with a turquoise hue illuminated by side windows. The walls were covered with pictures of Czech figures, such as the country’s patron Saint Wenceslas and the Radegast pagan mountain god. Jurkovič’s designs for the Luhačovice spa town were harshly criticized by Brno architect Karel Hugo Kepka and the editorial board of Architektonický obzor journal, which caused his commissions there to cease after 1914. 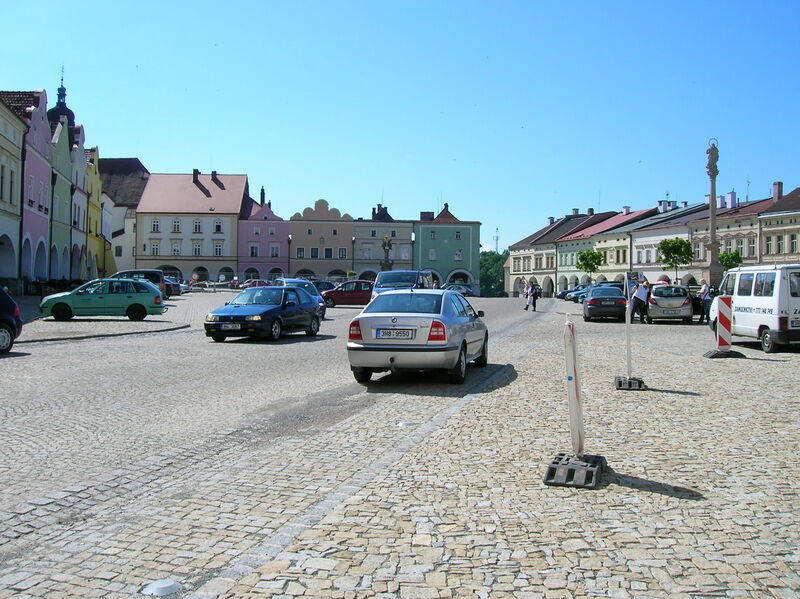 Today, though, residents of Luhačovice are very proud of Jurkovič’s work there. He also designed a house in the Bubeneč district of Prague 6, using concrete instead of wood and constructing an elevated gable. During World War I he designed about 40 cemeteries for fallen Austrian soldiers in what was then Galicia. After the war he concentrated on war memorials, and in the late 1920s he began to experiment with the functionalist style. 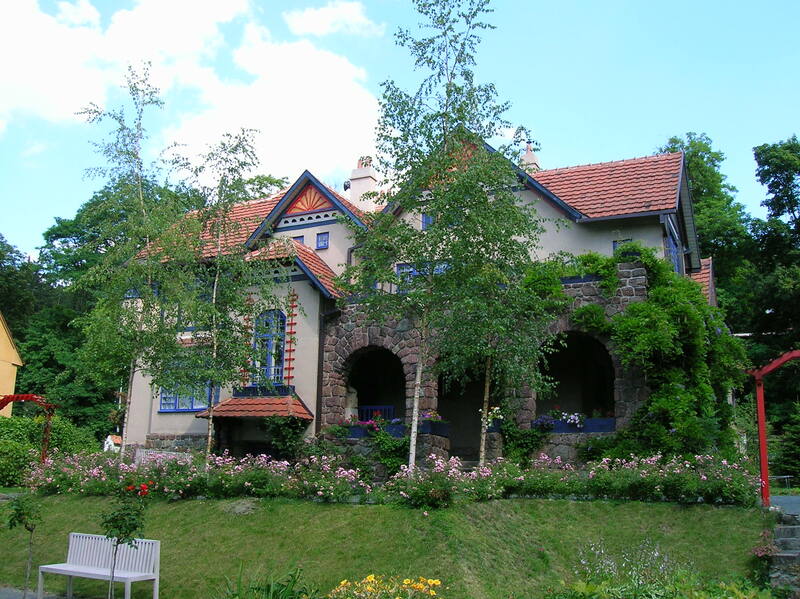 Jurkovič moved out of this villa in 1919, after democratic Czechoslovakia was created because he wanted to help reshape his native, reborn Slovakia. So he moved back to Bratislava, where he died in 1947. I loved the red color with floral pattern of the wooden beams on the ceiling. It had a log cabin appeal and gave the beams a vibrant folk architecture appearance. 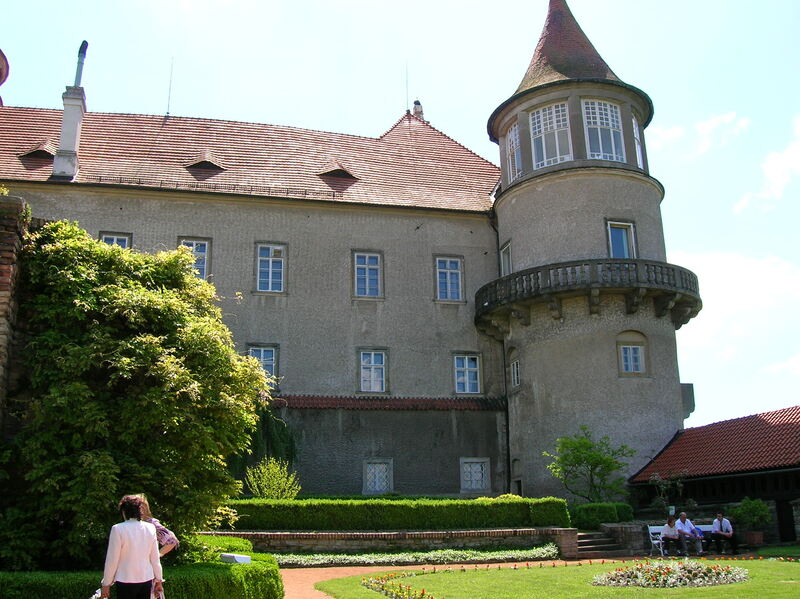 The entire villa exuded a warmth and coziness that I had also felt at Nové Město nad Metují’s Chateau. I was impressed with the tour, but disappointed that only the Staircase Hall looked as it had when Jurkovič had lived there. I understood that Jurkovič had sold a lot of the furniture. The Staircase Hall had such a dynamic quality. It was so vibrant, so cheerful, yet at the same time intimate. I wished that more than a few pieces of the original furniture and ornamentation had been preserved. While the temporary exhibition and spaces documenting Jurkovič’s works were intriguing, the Staircase Hall was definitely the highlight of the tour. Tracy A. Burns is a writer, editor and proofreader living in Prague. The journey was easy. It only took two and a half hours on a direct bus from Prague to get to this small town in the foothills of the Eagle Mountains, not far from Poland. It was sunny, almost too hot. From the stop I had to walk straight for about 10 minutes and turn left onto the large, impressive main square on which buildings of various architectural styles were erected. I noticed the remains of chiaroscuro decoration on the facade. Because I had been here 10 years earlier, I knew the interior was truly a sight to behold. But it wasn’t until the chateau was bought by the Bartoň family that perhaps the most significant renovations were carried out. Slovak architect Dušan Jurkovič and Czech architect Pavel Janák did many renovations in Art Nouveau, Art Deco and functionalist styles in this chateau also known for its collection of Czech and Slovak art from the 17th to 20th centuries. While Jurkovič concentrated on Art Nouveau, Janák took over the Art Deco and functionalist styles, his last renovations taking place from 1940-41. 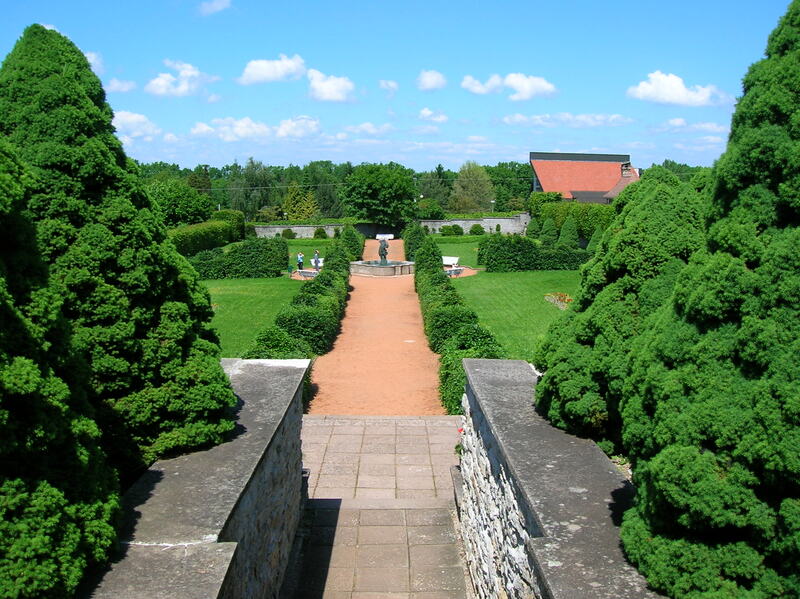 Jurkovič also was responsible for redesigning the two-tiered chateau gardens. 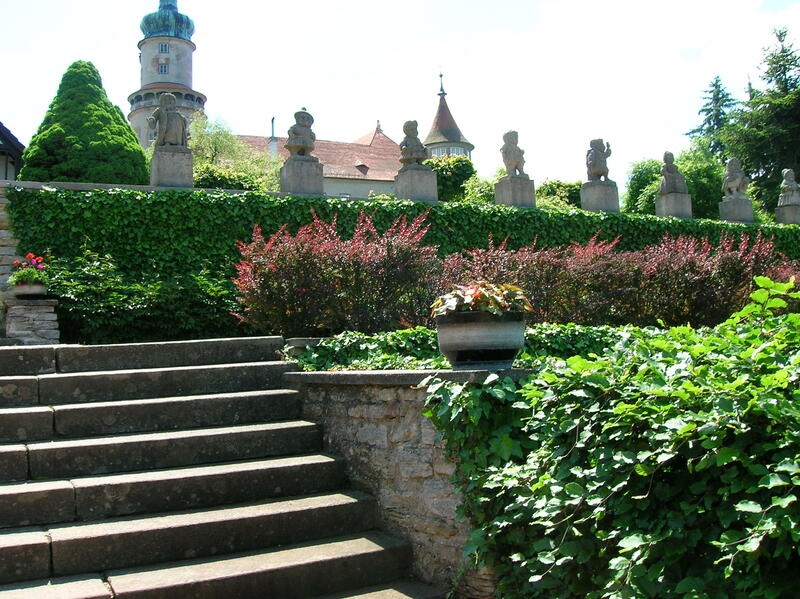 Though the Bartoň family emigrated to Canada in 1949, they got the chateau back in 1992 and are its present owners. 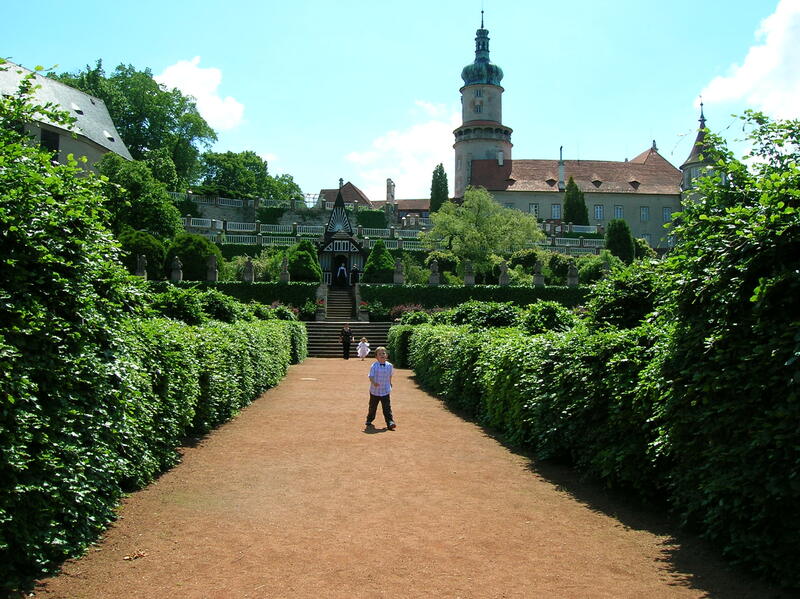 Before the tour I had time to visit the gardens and see Jurkovič’s outdoor masterpiece for myself. Terraces and flower beds punctuated the upper gardens while a quaint wooden bridge led me to the lower section. The sculptures of the stone dwarfs caught my attention immediately. They were the skilled work of famed Czech sculptor Matyáš Braun from the first third of the 18th century. I also noticed a statue of legendary Czech composer Bedřich Smetana and Baroque statues of the God Poseidon and the Goddess Demeter as well as two statues of bears. 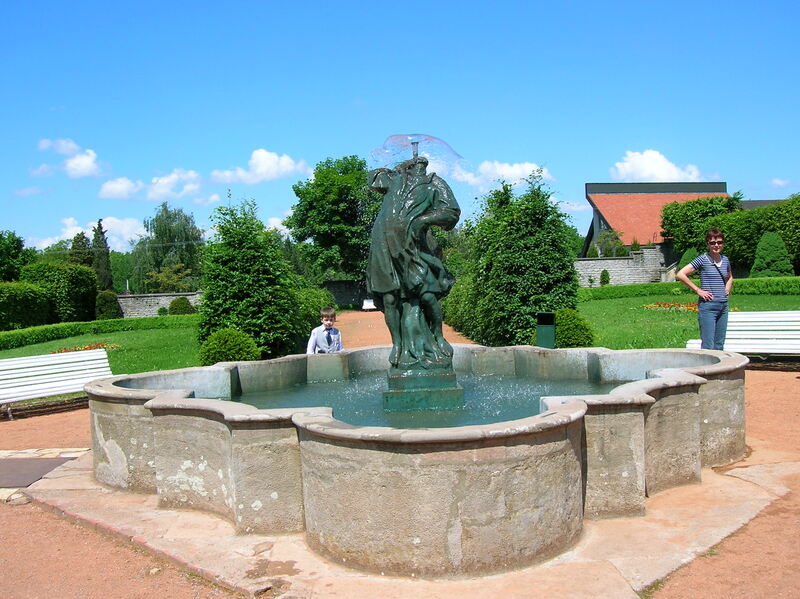 A Baroque fountain was situated in the garden, too. I felt like reading in the sun for a while here, but the tour was going to start soon and anyway, there was a wedding procession about to cross the wooden bridge and head in my direction. The gardens seemed to be the perfect place to bring a book and relax, occasionally glancing at the stone dwarfs and Baroque fountain. One of the first places we visited on the tour was the Rising of the Holy Cross Chapel from the 17th century. The fresco on the ceiling and the white stucco decoration had me gaping in awe. But more about that later. Then, in the hallway, I was overwhelmed by a 15th century Gothic altarpiece as we walked toward the Winter Garden. It was absolutely exquisite, depicting Saints Peter and Paul with an icon of Jesus Christ. The Winter Garden was one of my two favorite rooms, designed in the decorative style by Jurkovič in 1910. Plants abounded, and there was lovely white wicker furniture as well as many ceramics in the space. The walls looked to be made of rock inlaid with a tree design in brown. I thought how much I would love to sip a cup of green Eilles tea at the white table, surrounded by so many thriving plants and intriguing ceramics. My other favorite was the Coffer Room, a Jurkovič masterpiece from 1913. The wine red carpet and dark brown leather and oak furniture contrasting with a light and airy ceiling made me feel comfortable. There was also leather wallpaper on the ceiling and a huge green and brown marble fireplace made of ceramic tiles. A brass chandelier decorated the room as well. An avid Czechoslovak history fan, I loved the portrait of former President Masaryk, set in a gold frame. The room, with all its couches and tables, appealed to me as a place I would like to come and read on a cold winter’s night, while sipping hot chocolate. I somehow felt safe there, away from the worries of my life and the world. We also entered a room full of Cubist furniture designed by Janák. A hundred coats-of-arms of Czech towns were painted on the walls. On the ceiling I noticed pictures of the towns of Náchod, Český Krumlov and the Black Tower in České Budějovice. Some of the other rooms that particularly impressed me included: The Baroque bedroom, redesigned by Jurkovič in 1913. Swirling patterns decorated the arched ceiling, and there were three circular Renaissance frescoes on the wall above one bed. The Gentleman’s Study had an Art Deco interior forged by Janák in 1924. The central fresco was by František Kysela, who also painted many other frescoes in the chateau. Renaissance paintings hailing from the 16th century lined the walls. Textile art work and ceramics also punctuated the room. The space had a romantic flair, and I felt safe here. A sense of warmth exuded from the room. Dark wood mingled with a bright green color, with green upholstery on the dark wood chairs. The brown and white frescoes on the ceiling complemented the choice of furniture. What caught my attention in the Zodiac Room or Summer Dining Room was the exquisite handmade carpet. Inside an orange and light blue circle was another circle, this one in blue and orange, showing a proverb for each month. This Art Deco room, a 1923 creation by Janák, with brown wood furniture also boasted frescoes by Kysela. I had a ticket for the long tour, so I followed the guide, a tall, bespectacled man in his forties, to the second floor, where the frescoes in the rooms all showed scenes from Greek and Roman mythology. In the Hall of Victors, which was really a Baroque dining room, I noticed the neo-Baroque interior and Flemish tapestry from the 16th and 17th centuries. Still lifes also decorated the walls which were a light yellow color. The frescoes sported sea blue and dark green. The white and blue porcelain was ravishing. I cannot leave out the St. Hubert Room or the Hunters’ Room. This 17th century bedroom also boasts a ceiling fresco of Hypnos, the god of sleep. I was impressed with the vibrant colors of the fresco. Neo-Gothic and neo-Renaissance furniture from the 19th century contributed to the stunning look, too. From the Oratory there was a fantastic view of the chapel. There were vibrant ceiling frescoes and white stucco decoration on the ceiling. The left-hand side of the altar was decorated with a painting of Saint Barbara, forged by the Baroque master Petr Brandl, one of my favorite Baroque painters. The black with gold columned altar was flanked by statues. The small size of the chapel gave it a sense of intimacy. What awed me in the Oriental Dining Room was its luxurious, long and sleek chandelier with the bottom shaped as a Chinese pagoda. Before the tour ended, the guide told us the legend of the Black Lady, who haunts the chateau. From 1624 to 1629 Marie Magdalena was one of the owners of the place, and she was called “Evil Manda” for a very good reason. She was exceptionally cruel to animals, and the townspeople were fed up with her. They rebelled in 1628. Soldiers put down the uprising, though, and proceeded to treat the rebels cruelly. Many men were killed in a gunpowder explosion in the tower, leaving many widows and orphans in the town. “Evil Manda” died in 1633, but she still walked the halls at night because she was looking for the two or three bodies of the farmers who were never found after the gunpowder explosion. She wanted them to be buried. One could hear her footsteps at night, and sometimes paintings fell off the walls. Then I left the chateau and went to a nicely decorated restaurant across the square. The restaurant was decorated in orange and yellow and had a cheerful appearance. It served good food as well, and I was able to eat my favorite food on my excursions – chicken with peaches and cheese plus a diet Coke. Then it was time to get the bus back to Prague. When I made it to the stop about 20 minutes early, I was the only one there. Before long, about 10 people had joined me. We waited. And waited. And waited. The elderly women standing next to me grumbled to themselves about how it did no good to complain in this country. A teenager with hair dyed pink read a book on the bench. Finally, the bus arrived – 45 minutes late. The bus driver did not offer an excuse or an apology. I was just glad the bus came.